Periyar extends around the banks of a huge artificial lake that was created by the damming of the Periyar River in 1895. It has 780 square kilometers (485 square miles) of dense hilly forest, with 350 square kilometers (220 square miles) of this being core park land. Periyar is one of the most popular national parks in southern India, but these days this is more for its tranquil feel than sightings of wildlife, which many people complain can be few and far between at times. The park is known for its elephants, and 30 minute elephant rides through the jungle are offered. Periyar is located in Thekkady, around 4 kilometers (2.5 miles) from Kumili in the Idukki district of central Kerala. The closest airports are at Maduri in Tamil Nadu (130 kilometers or 80 miles away) and Kochi in Kerala (190 kilometers or 118 miles away). The nearest railways station is at Kottayam, 114 kilometers (70 miles) away. The scenery on the way to Periyar is beautiful, and includes tea estates and spice gardens. Unlike many national parks in India, Periyar stays open all year round. The most popular time to visit is during the cooler, drier months from October to February. However the aroma of the moist vegetation in the monsoon also gives it special appeal. The best time for viewing elephants is during the hotter months of March and April, when they spend the most time in the water. Don’t expect to see a lot of wildlife during the monsoon season because there’s no need for them to come out in search of water. Periyar is also best avoided on weekends due to crowds of day tourists. Periyar is open daily from 6 a.m. to 7 p.m. The Forest Department and the Kerala Tourism Development Corporation conduct two hour slow boat trips inside the park. The first one leaves at 7 a.m. and offers the best chance of seeing animals, along with the last one at 4 p.m. Other departures are at 9.30 a.m., 11.30 a.m., and 2 p.m. Guided nature walks that last for around three hours start between 7.00 a.m. and 10.30 a.m. in the morning, and 2.00 p.m. and 3.00 p.m. in the afternoon. All day border hikes and bamboo rafting trips leave at 8 a.m.
Foreigners pay 300 rupees ($7) to enter the national park. Boat trips cost 110 rupees for the upper deck and 75 rupees for the lower deck. Visitors should book their tickets well in advance from the boat jetty, near the Wildlife Information Center. It’s possible to hire your own boat from the Kerala Tourism Development Corporation and this is highly recommended to avoid the hoards of people and noisy children on the other boats. Nature walks cost 100 rupees per person, and bamboo rafting 1,000 rupees per person. Tiger Trail treks are 3,000 rupees ($70) for one night and 5,000 rupees ($115) for 3 nights. 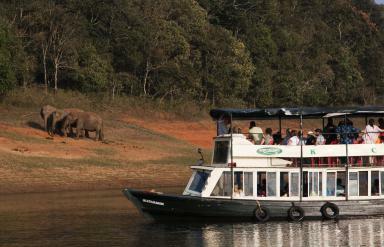 Safaris are only carried out by boat, making Periyar a peaceful place to be. The lake is particularly captivating at sunset. However, the best way to explore Periyar and see the wildlife is to participate in one of the many eco-tourism activities that are on offer. These include hikes through the forest with reformed poachers as guides, bamboo rafting, night time jungle patrols, trips to local villages on bullock carts, and tribal heritage visits. Periyar National Park is one of the few national parks in India to remain open during the monsoon. Most of the activities in Periyar are still weather dependent, but boat trips operate throughout the monsoon season. If you do visit Periyar during monsoon time and go trekking, keep in mind that leeches also come with the rains so make sure you wear the leech proof socks that are available at the park.